Guru pyaari saadhsangat jio, Sri Guru Arjun Dev Jee is telling us today who is the True Daathaa, the True Giver. Who is that True Giver, that Akaal Purakh Waheguru who gives daily, and never asks. Always giving, always giving, dhokhan dhaekhath hai par dhaeth n haarai. 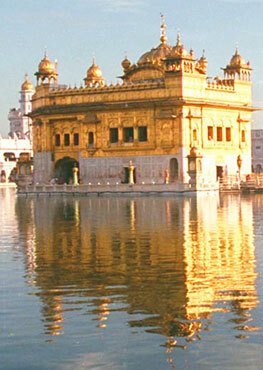 Waheguru Jee sees our dhokhan, sees our sins, but keeps giving, and keeps giving, never stops. Maharaj Guru Teg Bahadur Sahib Jee tells us that jagath bhikhaaree firath hai sabh ko dhaathaa raam. Jagath, the whole world is a bhikhaaree, is begging. We're always begging, sabh ko dhaathaa raam, Maharaj Jee says that God is the giver to all. Maharaj Jee is telling us to recognise that God is the True Giver, do not beg from other beggars, beg from the Creator Lord Who created the whole world. Thum dhaathae thaakur prathipaalak, Maharaj Sahib Jee is telling us, O Waheguru Jee, You are the dhaathae - You are the Great Giver, thaakur - You are the Lord of this world, prathipaalak - You are the one who nourishes and cherishes this world. Naaeik khasam hamaarae- You are my Naaeik, my Master and my Khasam, my Husband Lord. When this understanding comes into the being, it is a blessed state of life. Maharaj Jee is blessing us by showing us this path, this way of life. In this shabadh, Sri Guru Arjun Dev Jee Maharaj is saying to us this is the path of gursikhi, this is the path of uniting with the Lord, this is the mindset we must have. Nimakh nimakh - every moment, thum hi prathipaalahu- Waheguru Jee You are the one who cherishes us, who looks after us, who nurtures us. Hum baarik - I am your child, thumarae dhaarae - and I live on your dhaarae, dhaarae means your support. This is the complete state of being which the guramukh, the Guru centred being lives his/her life in, completely centred upon the Guru, completely centred upon Waheguru. Each and every moment dedicated to Waheguru, each and every moment this prayer upon their lips that Waheguru! You are the One that is nurturing me, You are my support, You are the only giver I look to, Waheguru! You are the only One Who nurtures us and cherishes us, no other. I have eaek, I have one jihavaa- one tongue, kavan gun keheeai - how can I count your countless blessings? Kavan - how many gun - virtues, keheeai - can I sing? How many of your virtues can I sing Waheguru! You are limitless. baesumaar - You are limitless, baeanth - infinite, suaamee - my Lord and Master, thaero anth n kin hee leheeai - not one has leheeai, has found your anth, your limits. Everything can be counted is this world, people have measured everything, whether its land, whether its the stars in the sky. Maharaj Sahib jee says it can all be measured, but Waheguru is the One Who is baeanth, Who is infinite, Who is baesumaar, Who is unlimited. No one can find the limit of God, of Waheguru. Maharaj Jee is saying hold on, pause and think about this, this is the state, this is the blessed avasthaa, the blessed experience which the Sikh of the Guru has, and Maharaj Sahib Jee is explaining it to us, describing it to us, putting it into words for us so that we can at least read through this blessed experience of spirituality. What prayer does the gursikh have on his/her lips? Maharaj Jee I've done kott - millions of paap, of sins, hamaarae khanddahu - and please khanddahu- wipe them away. Anik bidhee samajhaavahu - instruct me, anik - in countless, bidhee - ways. One person meditates upon the Lord after listening to a certain shabadh in the kirtan they heard at that Gurudwara. One person is awoken through an event in their life. One person is awoken by reading the Bani of the Guru. One person is awoken because they start doing simran, 5 minutes, 10 minutes, half an hour, an hour every day, because they take that daily practice into their lives. Maharaj Sahib Jee says that Waheguru jee, You are the One Who explains to us in all these many ways, You are reaching out to us and blessing us with this understanding, blessing us with this instruction, blessing us with this message of spirituality. The Guru reaches out to us at all times, the Guru's hand is always extended towards us. Maharaj Jee is telling us that the being is agiaan in the darkness of spiritual ignorance, alap math thoree - and our math, our understanding is thoree, is always tiny compared to the Lord's Grace, the Lord is limitless, it's like trying to fathom an ocean in a cup. That tiny cup can never hold the ocean. Then we realise this, that the ardaas, the prayer that should come to our lips, thum aapan biradh rakhaavahu - Waheguru Jee, it is your biradh, it is your nature to protect those that come into your sanctuary. Through your nature, through your virtues, rakhaavahu, save me. Thumaree saran- I have only got your saran your protection, thumaaree aasaa- I have in my heart only the aasaa, the desire for You, O God. Thum hee sajan suhaelae - from the day that I realised that You are my suhaelae, my most beloved sajan, my most beloved friend Who I can rely upon at all times in this world and the next, in this life and beyond. Raakhahu - please save me Waheguru because You are the Raakhanehaar, You are the Liberator, the Saviour, and always merciful. Naanak ghar kae golae - Maharaj Sahib Jee says that I am always the golae, the slave of your ghar, your house. In this Hukamnama Sahib today, Guru Sahib is explaining to us the steps that we need to take. We need to recognise that He is the only giver, only Waheguru can give, in the same way Waheguru Jee can take away. We need to recognise that our wisdom, our math, our intellect is too tiny to contemplate, to fathom the limits of the Lord Who is limitless. When we realise all of this, the ardaas we should have on our lips, the prayer we should have on our lips is thumaree saran - to enter into the protection of the Lord, thumaaree aasa - to only have desire for union with the Lord, thum hee sajan suhaelae - Waheguru is the true friend of the soul. Raakhahu raakhanehaar dhaeiaalaa - protect me O merciful Lord! naanak ghar kae golae - because we have dedicated our lives to the house of the Guru.